it is Also known as "Dakshina Kashi (Kashi of the South), Antarvedi, is an important pilgrim centre in the East Godavari district of Andhra Pradesh state in India, situated at the interior part at East coast. Lord Brahma, in order to get freed from the sins he had committed against Lord Sankara, had performed Rudrayaga and installed Lord Neela kantheswara there. As that place was made a stage or "Vedik" to perform the Yagam, it was named as "ANTARVEDI" It is a small village in Sakhinetipalle Mandal which is located close to Narsapur near the Bay of Bengal Coast and Vashishtha River. This river is said to have been brought by Maharishi Vashishtha, one of the Sapthrishis(seven great sages) of Hindu Mythology. It draws people from far off places throughout the year because of its unique rarity: the confluence or mergence of Bay of Bengal and Vashishtha River, a tributary of River Godavari. The place of confluence where the mighty ocean Bay of Bengal meets the Vashishtha River is called the "Sapta Sagara Sangam Pradesam" and also as "Anna Chelli Gattu". One can even taste the water here as it is not salty but quite sweet!!!! Unbelievable but true!!! This place is the last and the most important of the seven sacred bathing places. It is popularly believed that the Tretha Yugam episode of Ksheera Sagara Mathanam took place here. 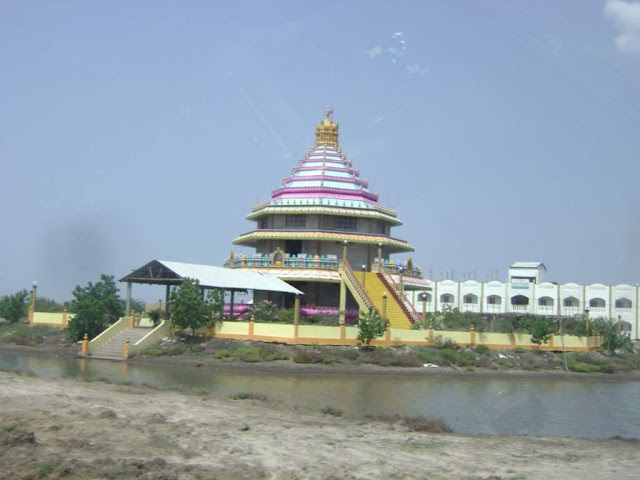 The temple is called as an island temple because of its confluence. This temple is among the rarities as the main Deity i.e. Lord Sri Lakshmi Narasimha Swamy(one of the ten incarnations of Lord Vishnu) who faces towards West instead of East (usual direction of other temples in India) constructed between the 15th and 16th centuries. This is 32 kshetra of 108 Narashima kshetrams. It is a temple of 5 storeyed Vimana Gopuram. As one enters the temple one can Garuda on one side and Bhaktha Anjaneya on the other side of temple entrance. While approaching "Garbha Gudi" (Sanctum Sanctorum) one can see an adorable "Vatapatra Sayi" (Lord Krishna on a palm leaf) on its roof. The idol is made from a single stone. In the Garbha Gudi, one can have a darshan of the magnificient Lord Sri Lakshmi Narasimha Swamy with his Consort Goddess Lakshmi Devi on his lap. After the darshan, one has to go around the sanctum, as there are different deities. On the east side of the prakaram(wall), is Goddess Rajyalakshmi and Lord Venkateshwara, to the north side is Bhoodevi and Ranganadha Swamy, to the west side of the prakaram is Santhana Gopala Swamy and Keshava Swamy, and finally to the south side of the prakaram is the Acharyas and Alwars sannidhi(small temples) and Chaturbhuja (four-armed) Anjaneya. Apart from the presiding Deity, Lord Narasimha Swamy, there are also Deities of Brahma, Vishnu, and Shiva. A temple of Neelakanteshwara (Lord Shiva) is also present which is located at the other side, almost nearer to the bank of Godavari, also called, Vasishta Godavari is a must see. This deity was installed by Lord Sri Rama and is said to be worshipped by Brahma himself. This temple was constructed in the year 2005-06. This Mahameru Sahita Sri Kurma pratishtapana of Vasishta Devalayam is near Sri Narashima Swamy temple. The building is in circular form and the height is 54. It is said that Sri chakram is kept to same depth down i.e. 54. One has to climb few steps to reach the first level. Here, one can see Saligrama tortoise, a sacred Gandaki river stone which is believed to be a special Avatara of Maha Vishnu and is always placed with Tulasi (signifying Goddess Lakshmi). It is on this Saligrama that the Maha Meru of Emerald is installed. Thankfully, one is allowed to enter inside the sanctum, and as one goes around one can see Dashavataram (10 incarnations of the Lord) sculptures of Saligrahama stone that have been installed. On the second level one can have the darshan of Saptha Maharishis. Every year on the day before Bhishma Ekadashi i.e. Dashami, which is observed Magha Shukla Ekadashi (Eleventh Day) in Magha Masam (February) Lord Sri Sri Lakshmi Narasimha Swamy Kalyanotsavam (divine wedding of Lord Sri Sri Lakshmi Narasimha Swamy and Goddess Lakshmi Devi) is celebrated with much enthusiasm. On the Bhishma Ekadashi, the Rath Yatra is celebrated. Devotees in huge number attend to watch the Celestial Wedding and take holy dip at the sangamam (Saptha Sagara Sangamam).During the month of November, throngs of devotees come to the temple premises to witness the Deity of Narasimha Swamy without any of the ornaments, garb, or chandanam (sandal paste) that normally adorn the Lord's Form. In the month of Phalguna (January), the Lord's chariot procession is held. Dole pournami celebrations are also held, when the Lord is worshipped with panchamrita abhishekam. Sri Venkateswara Swamy kalyanam, (Jyeshta Sudha Ekadasi)., Sri Narasimha Jayanthi (Vysakha Sudha Chaturdasi) are the other festivals celebrated here. For tourists as well as pilgrims one can hire ferries(boats) which are available to visit the small island that is on the other side of the river and also to the point where the river and the ocean actually meet. On off seasons, one avail the ferry service for a nominal fee whereas in the peak seasons the fee rises alarmingly. The cost varies depends on the number of people. If limited a number of people are willing to visit the island, a nominal amount of INR 350 will be charged. If a more number of people are available, INR 50 will be charged for each person. Antarvedi is 130 Kms from Kakinada and 100 kms from Rajahmundry. One can reach Antarvedi either by train or by road. For those who travel by train one can either board or get down at either Rajahmundry or Narsapur. There are number of buses available from Kakinada and Rajahmundry also. Or one can board a bus at Hyderabad to Razole, whereon they can go to Malkipuram and thereto Antarvedi. Antarvedi can also be reached by boat from Narsapur, which is 112-km south of Rajahmundry.